Dr. Tina Montreuil is an Assistant Professor in the department of Educational and Counselling Psychology and an Associate Member of the department of Psychiatry at McGill University. She is also a Regular Investigator of the Research Unit of Children’s Psychosocial Maladjustment (GRIP) at McGill.As a licensed member of the Quebec Order of Psychologists and a credentialed member of the Canadian Association of Cognitive-Behavioural Therapies, she practices privately with children and family, focusing on cognitive-behavioural and mindfulness approaches. She has published in several peer‐reviewed journals and has been a lecturer at several international conferences. In 2013, Dr. Montreuil was awarded the title of "Champion" in Mental Health in the "Research" category from the Canadian Alliance on Mental Illness and Mental Health, and was more recently included in TheTop 150 Leading Canadians for Mental Health by CAMH Difference Makers. She currently holds a number of grants from provincial and federal funding agencies in support of her school-based research. Dr. Montreuil's current research focuses on investigating the role of emotion regulation, attitudes, and beliefs on the development and intergenerational transmission of psychopathology and how symptoms of mental health problems might interfere with self-regulated learning in a group context and ultimately, educational achievement. Mediators and moderators of emotion regulation and resiliency such as the role of parental socialization of emotions on the use of emotion regulation strategies in children are also investigated. In addition to the universal emotion regulation school-based program called Healthy Minds, Healthy Schools, C.A.R.E. Research Group has developed a complementary parenting program called Parenting C.A.R.E.. In addition to promoting mental health literacy, much of Dr. Montreuil's Research Group activities focus on advocating for the implementation of School-Based Mental Health practices and philosophies. She is currently a member of a number of regional and provincial working groups whose primary aim is to define how to implement and promote mental health and well-being in schools. Dr. Montreuil's work focuses on identifying the clinical correlates and the cognitive underpinnings of social anxiety and emotion regulation in child development and psychopathology, in order to devise evidence-based interventions. One of the primary goals is to determine whether we can establish developmental profiles in children with social and functional difficulties and future onset of psychopathology on the basis of emotion self-regulatory processes. Dr. Montreuil's research also aims to investigate how emotion regulation deficits and social anxiety impact school adaptation and academic achievement in small group learning contexts. Développement de méthodes pédagogiques innovantes de prise en charge des troubles cognitifs et psychiques dans l’enseignement supérieur. Masters and Doctoral Students in School/Applied Child Psychology and Counselling Psychology. Graduate supervision may also be offered to any other students from an ECP program with a relevant research area. Interested candidates should forward a CV, transcript and a letter of intent. Montreuil, T. & Tilley*. M. (2017). 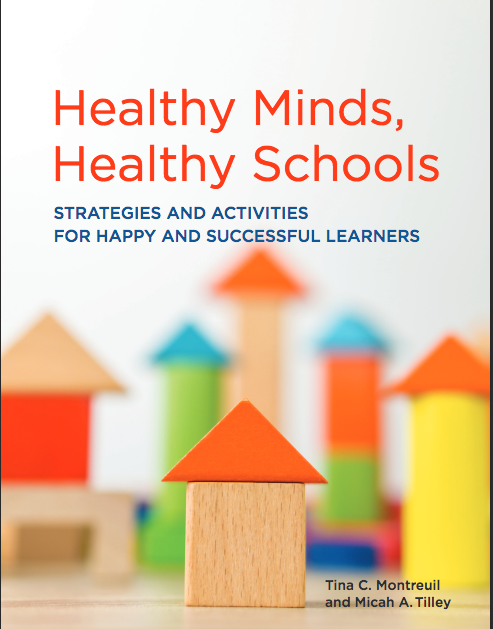 Healthy Minds, Healthy Schools: Strategies and Activities for Happy and Successful Learners. Canadian Scholars Press. Montreuil, T. (2016). Social Anxiety: Implications for Group Learning. The ABCT Child and School Special Interest Group Newsletter. Comtois, G., Villeneuve, M., Lalonde, P., Rodriguez, J.-P., Montreuil, T., Beaudoin, O., Sieres, K., Ménard, A., & Dubé, F. (2016). Comprendre un premier épisode de psychose...pour mieux agir! Société québécoise de la schizophrénie et des psychoses apparentées. Bibliothèque et Archives nationales du Québec. Bibliothèque et Archives Canada. Montreuil, T. & Kimhy, D. (2015). Emotion Awareness and Regulation as a Predictor for Increased Risk of Mental Illness in Children and Adolescents: A Systematic Review of Literature. Canadian Academy of Child and Adolescent Psychiatry (CACAP), Quebec City, Quebec, Canada. Montreuil, T., Malla, A., Joober, R., Bélanger, C., Myhr, G., & Lepage, M. (under review). Stigma Reduction following Group Cognitive-Behavioral for Social Anxiety in First-Episode Psychosis and Ultra-High Risk. Social Psychiatry and Psychiatric Epidemiology. Montreuil, T., Makowski, C., Charkravarty, M., Malla, A., Joober, R., & Lepage, M. (in preparation). Structural and Morphological Abnormalities of the Amygdala in First Episode Psychosis: An MRI study. Montreuil, T. & Lepage, M. (2014). Intervention de groupe cognitivo-comportementale manualisée pour l'anxiété sociale en premier épisode de psychose - Manuel du participant. Montreuil, T. & Lepage, M. (2014). 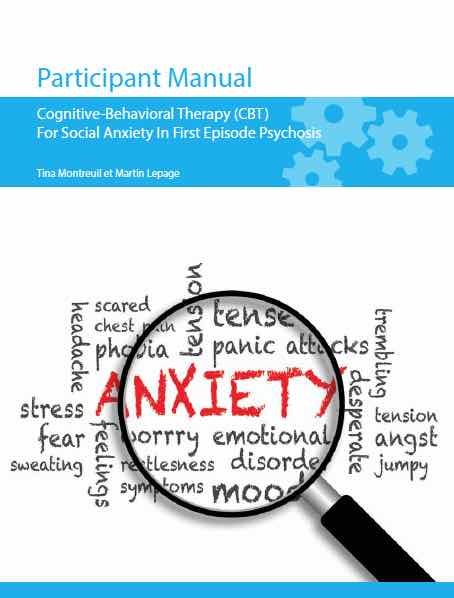 Manualized Group Cognitive-Behavioral Therapy for Social Anxiety in First Episode Psychosis - Participant Manual. Montreuil, T. & Lepage, M. (2013). Manualized Group Cognitive-Behavioral Therapy for Social Anxiety in First Episode Psychosis - Clinician Manual. Montreuil, T. & Lepage, M. (2013). Intervention de groupe cognitivo-comportementale manualisée pour l'anxiété sociale en premier épisode de psychose - Manuel du clinicien. Montreuil, T. (2018, August). Healthy Minds Healthy Schools: The Effectiveness of School-Based Emotion Regulation Program. Paper presentation accepted at the EARLI Conference SIG 18 and 23, Groningen, The Netherlands. Marchica*, L., Mills, D. J., Derevensky, J., & Montreuil, T. (2018, July). Investigating emotion regulation, anxiety, and dispositional mindfulness as moderators of gambling to cope. Paper presentation accepted at the National Council of Problem Gamblers, Cleveland, OH. Auzou, E., Géroult, E., Benoit, C., Delfolie, D., & Montreuil, T. (2018, June). Quand les Neurosciences deviennent un outil d’intervention pratique au service des étudiants: Retour sur l’expérimentation d’un enseignement méthodologique de strategies d’apprentissage universitaire, à partir des savoirs métacognitifs. Présentation acceptée au 6ème congrès de l’Association pour la Recherche en Neuroéducation, Paris, France. Montreuil, T., & Tilley*, M.A. (2018, June). Healthy Minds Healthy Schools: The Importance of School-Based Mental Health Literacy. Paper presentation accepted at the International Congress of Applied Psychology, Montreal, QC. Marchica*, L., Montreuil, T.C., Tilley*, M. A. (2018, June). Anxiety as a Mediator of Metacognitive Abilities and Emotion Regulation in Children. Paper presentation accepted at the International Congress of Applied Psychology, Montreal, QC. Cabecinha-Alati*, S., & Montreuil, T. (2018, June). Parental emotion regulation skills as a predictor of parents' emotion socialization practices. Poster presentation accepted at: International Congress of Applied Psychology 2018, Montreal, QC. Edels*, R., Leong*, E. L., & Montreuil, T. C., (2018, June). Student Experience of Shame and Guilt: The Association with Parental Emotion Socialization. Poster to be presented at the 29th Annual International Congress of Applied Psychology (ICAP) Convention, Montreal, QC. O’Hara*, G. & Montreuil, T. (2018, June). Observing group learning in the classroom: Implications for anxious students. Poster to be presented at the 29th International Congress of Applied Psychology, Montreal, QC. Edels*, R. & Montreuil, T. (2018, February) Parent-Child Connectedness and Emotion Regulation Strategy Use. Presented by Rayna Edels at the National Association of School Psychologists Annual Convention, Chicago, IL. Montreuil, T., Tilley*, M. A. (2018, February). Healthy minds, healthy schools: A school-based emotion regulation program. Paper accepted for presentation at the annual convention of the National Association of School Psychologists, Chicago, IL. Cabecinha-Alati*, S., O’Hara*, G. & Montreuil, T. (2018, February). Parental emotion socialization: A predictor of adult emotional functioning. Poster presentation accepted at: National Association of School Psychologists Annual Convention 2018, Chicago, IL. Leong*, L., & Montreuil, T. (2018, February). Childhood Achievement Emotions, Metacognitive Strategy use and Student Learning. Poster presentation accepted at: National Association of School Psychologists Annual Convention 2018, Chicago, IL. Montreuil, T. (2017, February). Emotional Intelligence: Its Role in Healthcare Professional Wellness, Leadership and Patient-Centered Care. Sandison Education Day Keynote Address. McGill University Health Center, Montreal, Canada. Montreuil, T. (2016, November). Anxiety, Stress and Increased Risk for Severe Psychiatric Disorders: Implications for Prevention and Early Detection. Montreal Children's Hospital, McGill University Health Center, Montreal, Canada. Montreuil, T. (2016, November). Healthy mind, healthy child: How parents can help their children overcome anxiety”. Educational and Counselling Psychology - Effective Parenting: New Trends and Approaches. McGill University, Montreal, Canada. Montreuil, T. (2016, October). Social Anxiety and Emotion Regulation: A CBT Intervention for Improved Group Learning. ABCT Convention. New York, United States. Montreuil, T. (2016, April). Parental Influences on Children’s Emotional Regulation: “How you react matters!” L'influence parentale sur la régulation emotionnelle chez l’enfant : “Votre réaction laisse sa marque!”. Association de Parents de Ville Mont-Royal, Canada. Montreuil, T. (2016, April). Emotion Regulation and the Developing Brain: Psychological and Educational Perspectives. McGill University, Montreal, Canada. Montreuil, T., (2015, September). A Case for Emotional Intelligence. Biological and Biomedical Engineering Symposium, McGill University, Montreal, Canada. Montreuil, T. (2015, June). Group Cognitive-Behavioral Therapy for Comorbid Social Anxiety in Psychosis. Douglas Research Centre, Verdun, Canada. Montreuil, T. (2015, May). Social Anxiety in Psychosis. Douglas Mental Health University Institute, Montreal, Canada. Montreuil, T. (2015, April). Promoting Early Intervention and Prevention of Psychopathology: The Role of Schools in Building Emotional Resilience. McGill University, Montreal, Canada. Montreuil, T. (2015, April). Emotional Intelligence – Practical Applications. McGill University, Montreal, Canada. Montreuil, T. (2015, April). Emotional Intelligence – Why is it important and why you need it? Douglas Research Centre, Verdun, Canada. Montreuil, T., (2014, November 18). Stress Management: Who has time for that? Women’s Health Initiative – Royal Victoria Hospital Foundation, Montreal, Canada. Montreuil, T., (2013, November). A Case for Emotional Intelligence: What is it and why it matters. McGill University – Teaching and Learning Services, Montreal, Canada. Montreuil, T., Malla, A., Joober, R., Bélanger, C., & Lepage, M. (2013, May). Group Cognitive-Behavioral Therapy for Social Anxiety in Psychosis: Does it work?, Early Intervention in Psychosis – Current Knowledge and Future Directions, Montreal, Canada. Montreuil, T., (2013, May). A Case for Emotional Intelligence. McGill University – Career Services, Montreal, Canada. Montreuil, T., (2013, March). Emotional Intelligence: A Brief Review. Royal Victoria Hospital – Royal Victoria Hospital Foundation Women's Health Initiative, Montreal, Canada. Montreuil, T., (2013, February). A Case for Emotional Intelligence: What is it and why it matters. McGill University – Teaching and Learning Services, Montreal, Canada. Montreuil, T., Malla, A., Joober, R., Bélanger, C., & Lepage, M. (2012, October). Group Cognitive-Behavioral Intervention for Social Anxiety in First-Episode Psychosis, International Conference on Early Psychosis, San Francisco, US. Montreuil, T., Malla, A., Joober, R., Bélanger, C., & Lepage, M. (2012, July). Group Cognitive-Behavioral Intervention for Social Anxiety in Schizophrenia. International Congress of Psychology, Cape Town, South Africa.